Works on Kids, Adults & Dogs! Bulk orders by the case. 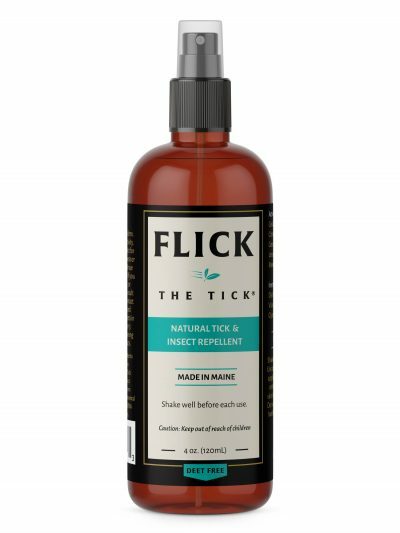 Flick the Tick is a natural tick repellent made with a custom effective natural oil blend that is DEET-FREE, and smells great! Helps repel ticks, mosquitoes, black flies, sand fleas, and horse flies! 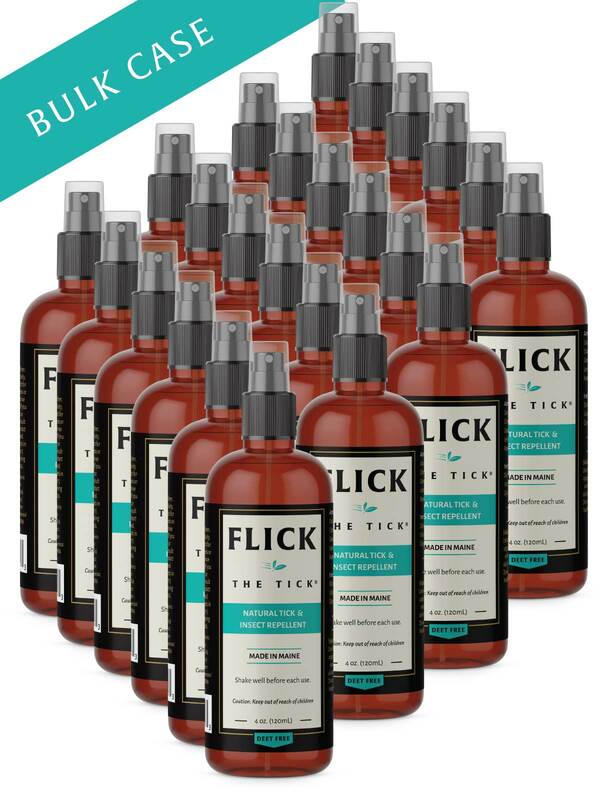 Flick the Tick is a natural tick and insect repellent made with a custom effective natural oil blend that is DEET-FREE, and smells great! 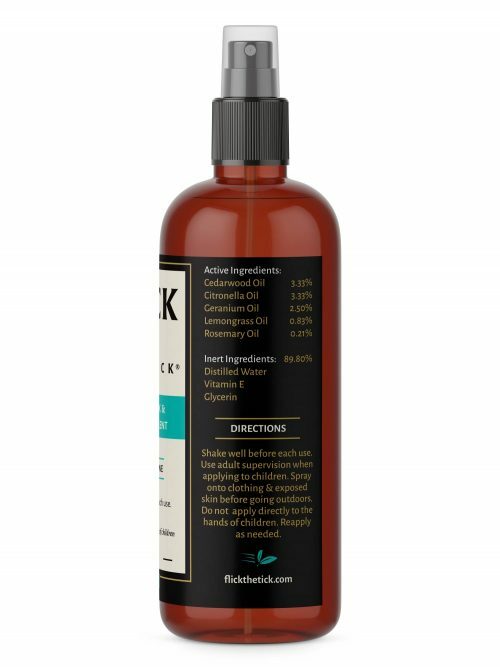 Our special essential oil blend is made to help keep ticks and insects such as black flies & mosquitoes away. Comes in a perfect sized 4oz spray bottle. Shake well before each use. Use adult supervision when applying to children. 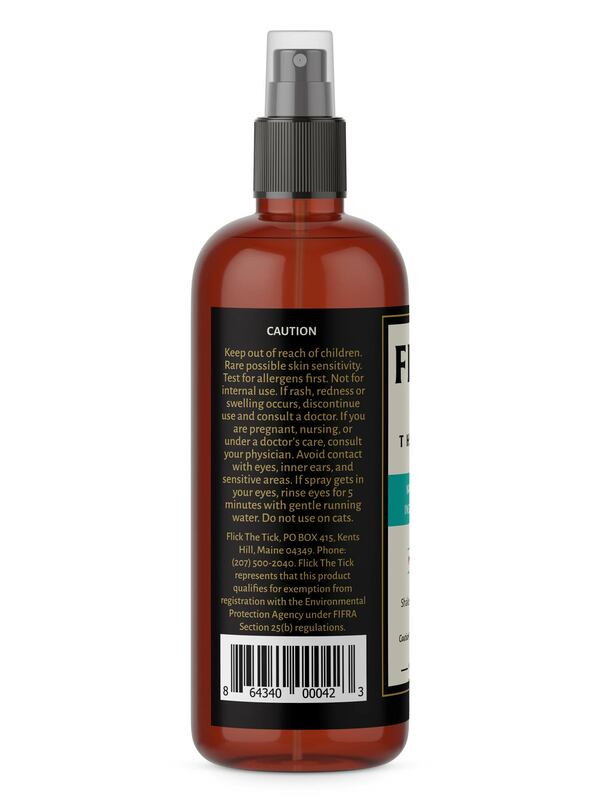 Spray onto clothing & exposed skin before going outdoors. Do not apply directly to the hands of children. Reapply as needed. * At this time we are not available for sale in the state of Virginia. Keep out of reach of children. Rare possible skin sensitivity. Test for allergens first. Not for internal use. If you are pregnant, nursing, or under a doctor’s care, consult your physician. Avoid contact with eyes, inner ears, and sensitive areas. Do not use on cats. Flick The Tick represents that this product qualifies for exemption from registration with the Environmental Protection Agency under FIFRA Section 25(b) regulations.